Make your '07-'17 Jeep Wrangler's "Power Bulge" style Hood stand out with this tough looking Hood Graphic kit. Graphic package is not just a rectangle of vinyl in a box. Our graphic kit consists of a prefitted and contoured piece as shown in the illustration. 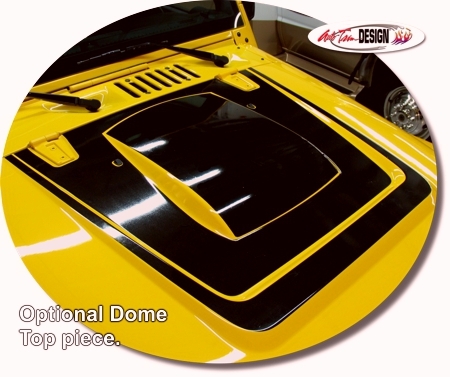 Kit is specifically made for the '07-'17 Jeep Wrangler factory "Power Bulge" style Hood (usually found on the Call of Duty, MOAB or Polar Edition vehicles) as shown and will not fit any other vehicle or style of Hood (MOPAR® Moab Edition Power Bulge Hood, part 68146820AB). "Power Bulge" center piece available as an option (ATD-JEEPWRGLRGRPH24). Due to compound curves found on the Power Bulge, professional installation assistance may be required.